Over the years, ECHO has investigated some simple methods for reducing moisture content of seeds in preparation for storage. Drying seeds in preparation for storage and maintaining dry conditions in storage both help prevent the growth and harmful effects of mold on seed viability. Recently, Rick Burnette (Director of the ECHO Asia Regional Office) and Abram Bicksler (International Sustainable Development Studies Institute) have been experimenting in the seasonally high-humidity environment of Chiang Mai, Thailand. Results are shared in a Technical Note compiled by Dr. Tim Motis (called Seed Saving Tips and Technologies) and are excerpted here. Before seeds go into storage, they should be dried—either in the sun or with any other technique or device that will circulate heated or reduced-humidity air in/around the seeds to be dried. Regardless of the method, monitor temperatures to avoid subjecting the seeds to excessive heat. Maximum safe temperatures vary depending on the crop; at ECHO, we keep the temperature in our seed dryer at or below 100°F (38°C), which is safe for most seeds. Figure 1: Drying cabinet sometimes used at ECHO to dry seeds. For optimum long-term seed storage, seed moisture content should be reduced to 3 to 8% (IBPGR Handbook 1985). Although 3 to 8% seed moisture may be difficult to attain in the tropics, it gives an optimum for which to strive. An easy way to determine seed moisture content, without having to destroy any seeds in the process, is to use existing tables to predict seed moisture content based on percent relative humidity (see Chapter 3 of the IBPGR Handbook mentioned above). Figure 2: Seed dryer modified for use where humidity is sometimes high. When drying beans, a rule of thumb to test for adequate dryness is that when you bite down on a seed, no bite mark should be visible on the seed surface. If you notice bean or pea seeds splitting while drying, try drying them at a lower temperature. 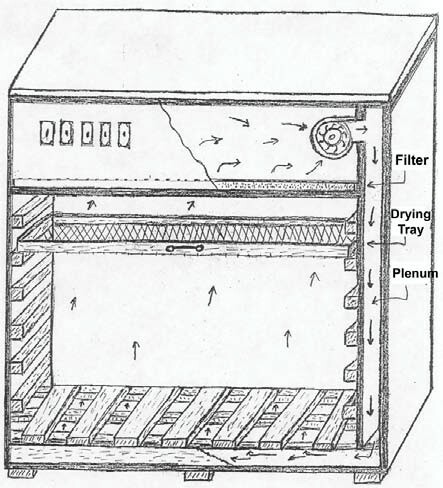 ECHO sometimes uses a drying cabinet (shown in Figure 1) to dry seeds. Cabinet dimensions may be varied to suit the material that is available to you. The cabinet consists of two chambers. The upper chamber contains four sixty-watt incandescent light bulbs to furnish heat, and a radial or squirrel cage fan to produce air movement throughout the cabinet. The lower chamber is built to accommodate drying trays with wire mesh bottoms or bins or canisters with perforated sides that can be stacked. The two chambers are separated by a filter made of fiberglass or any other material that prevents dust from being recirculated. The fan moves the heated air from the upper chamber into a plenum which encompasses one entire side of the cabinet. This plenum is approximately 2 inches (5 cm) wide. The air moves downward and under the plenum wall. It moves under and upwards through a latticed floor, then upwards through the drying trays or containers, and finally through the filter into the upper chamber to be reheated and recirculated. 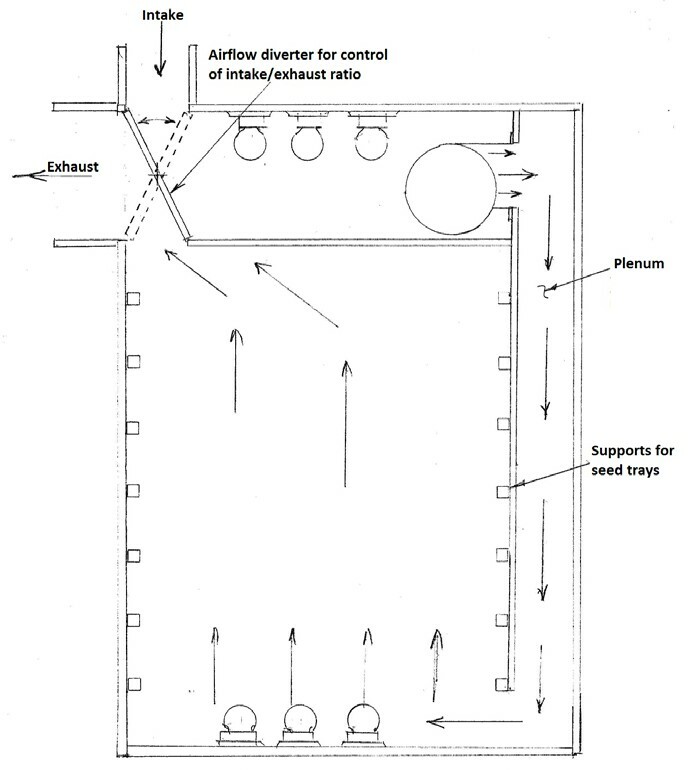 Using a modified design recommended by Joe Holley (Figure 2), Abram Bicksler, Rick Burnette and Scott Breaden found that the performance of a seed drying cabinet operating where humidity is high could be improved by including intake and exhaust ports and an additional lower bank of lights as shown in Figure 2. The additional lights help to better distribute heat throughout the cabinet. By virtue of a diverter that can shift, the modified design allows for control over how much air is being recirculated in the cabinet vs. how much is exhausted outside the cabinet. With the diverter shifted all the way to the left (i.e. wide open), all of the air entering the cabinet can be exhausted. With the diverter shifted all the way to the right, all the air is recirculated within the cabinet instead of being exhausted to the outside. Based on current heat and humidity conditions where the dryer is located, the diverter can be adjusted to allow the necessary amount of heated air to recirculate inside the cabinet to facilitate drying. Exhausting all of the air outside the dryer helps control humidity, but the light bulbs will not heat the air as much as they would with most of the air recirculating inside the cabinet. If your dryer is placed in an air-conditioned room, where ambient humidity is low to begin with, you can rotate the diverter more to the right to increase temperatures and reduce drying time. Should the dryer be located in a non-climate controlled location, under excessively hot conditions, high temperatures inside the cabinet can be moderated by opening the diverter more to the left. Lights can also be turned off and on to better maintain constant temperatures. The modified cabinet described here is often used to dry seeds, but the ECHO Asia seed bank staff has also successfully used it to dry moringa leaves under very humid conditions. The previously mentioned Seed Saving Technical Note also includes information about the use of desiccants, a good option for maintaining low seed moisture content when placing seeds in long-term storage containers. Also see EDN 86, which contains an article by Dr. Edward Berkelaar about using sealed and buried PVC tubes (or buckets) to store dried seeds.